Tops available: Willow Inlay, Pinwheel Willow Inlay, Barn Wood, Oyster, Oak, Pine, Slate (pictured). Can this be made 36 inches tall? Cost? 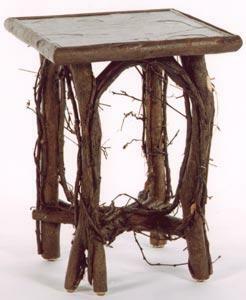 Bramble end tables range from $275-$315 depending on the top you select. A custom size of 36″ would add another $65. Let me know if you have a specific top in mind and I can give you a more accurate cost.